Neart in Aontas. Sin é an mana atá ag Cumann Peile Naomh Pádraig. Ar ndóigh ní raibh an mana sin ag an gCumann nuair a bunaíodh é beagnach ceithre scór bliain ó shin. Saol difriúil amach is amach a bhí ann ag an am. Tír difriúil ba ea Éire. Bhí an Dara Cogadh Mór a rinne scríos ar thíortha na hEorapa ar tí briseadh amach. Céard a spreag grúpa beag fear sa gceantar seo cumann peile a bhunú ?. Chuile sheans nach raibh aon aidhm mhór idéalach acu, nach raibh uathu ach struchtúr agus eagar a chur ar chluichí peile sa gceantar agus deis a thabhairt do fhír óga Dhuiche Seoigheach dul san iomaíocht le fir óga as ceantair eile. Bhí fadhbanna go leór ag an gcumann sna blianta tosaigh. Ní raibh ach fíor bheagán carranna agus bhí an ceantar fairsing, Ar ndóigh ba í an imirce an fhadhb ba mhó agus theip ar an gcumann ar feadh tamaill mar gheall ar seo. Ach d’fhas na siolta a chur na fir croga seo agus dá mbeadh siad inann teacht ar ais anois is ar éigean go n-áithneódh siad toradh a gcuid oibre. Tá Cumann Peile Naomh Pádraig sa lá tá inniú ann ag freastal ar phobal an dá pharóiste Cill Bhríde agus An Fháirche. Tá fir, mná agus páistí ón Lionán, An Mám, Corr na Móna, An Chloch Bhreac, An Fháirche, Cill Bhríde agus Fionnaithe ag teacht le chéile faoi scath an chumainn agus níl dabht ar bith ach gurb é an cumann peile an eagraíocht is tabhachtaí agus an eagraíocht is mo a bhfuil tionchar aige i nDúiche Seoigheach. Football has been played in Joyce Country since the beginning of the last century. There was no formal GAA Club in the area until about 1938 but groups of young men would get together on Sundays to play games. Sometimes teams would travel to neighbouring parishes to play games and there are stories told about teams going across Lough Corrib in boats to play in Oughterard. Proinsias De Búrca from Corr na Móna won an All Ireland medal with Galway in 1934. Proinsias was president of the club for many years. The Guinness estate was acquired by the Department of Lands in 1938. A deputation of local men – John J Burke, Tommie Joe Kyne and Edward Lynch went to Dublin to meet the Minister for Lands, Gerard Boland and managed to get a lease on the land which is now Páirc Sheoighe for an annual rent of £5 which was a lot of money at that time. The pitch was opened on St. Patrick’s Day 1940 and the club was active for a number of years but it went out of existence after some time. However, Jackie Burke continued to pay the rent thereby retaining the use of the field for the club. In the early 50’s there was a resurgence in football in the area. Seamus Kyne won an All Ireland Minor medal with Galway in 1952. In 1953 players from the area played with Oughterard and reached the County Final. In 1954 Cumann Naomh Pádraig was reformed. In those years there was a shortage of players due to immigration and sometimes the teams were augmented by players from Clifden and Renvyle. The main achievement in those years was winning the County Senior League in 1956. They defeated Tuam Stars who were in the middle of a seven in row County Championship wins. The game was played in Athenry and Naomh Pádraig won on a scoreline of 3-5 to 2-7. 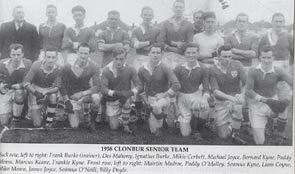 During the 50’s there were a lot of 7 aside tournaments and teams from Clonbur took part winning many. On one occasion in the Neale a game between Clonbur and Castlebar lasted 70 minutes instead of 30 because it took three periods of extra time before Clonbur eventually won. In 1959 Naomh Pádraig were defeated by Corofin in the County Junior Final and again in 1961 by Milltown. That game in 1961 was played on New Years day in 1962 and the result was the first GAA result ever read out on Raidio Éireann. Finally in 1962 Naomh Pádraig made the breakthrough by beating Caherlistraine in the County Junior Final on a scoreline of 1-12 to 0-2. Ironically on the same day a team made up of players from Naomh Padraig and Oughterard won the West Board senior final, Séamus Kyne accepted the both cups. After a period playing senior football, the club slipped back to junior again. During those years immigration was a serious problem in Joyce Country like many other places. ended up playing for Connemara Gaels in New York and for other clubs in the U.S. and England. The club continued to field at Junior level without any great success. Marcus Conroy played junior Football with Galway in the early seventies. Steven Kinneavy and Michael Conroy played for the Galway minors in 1972 and were beaten by Cork in the All-Ireland semi-final. Steven Joyce and Barry O’ Sullivan played minor for Galway in 1975. Steven Joyce won an All-Ireland medal with the Mayo Vocational schools that year and in the following year Gerry Keane won an All-Ireland medal with the Galway Vocational schools. In 1976 Cumann Naomh Padraig won the West Board Under 21 final and were beaten in the County Final by Corofin. Martin Joyce, John Flynn, Steven Joyce and Michael Conroy were members of the Galway U21 Team. With those and other good young players coming through the team improved and Naomh Pádraig contested the County Junior Final against Monivea in 1975 and again in 1976 against Caherlistraine without success. However, in 1977 Clonbur beat St.Brendan’s of Ballygar Newbridge in the County Junior final and were back playing Senior Football. Bhuaigh Cumann Naomh Pádraig Craobh na hÉireann i ngrád na soisear i gComortas Peile na Gaeltachta sa Daingean i 1977. Bhuaigh an Cumainn Craobh na Gaillimhe sa gComortas in grád na sinsir i 1978,1979, 1983,1984, 1985,1986,1987, 1990 agus i 1997 ach níor eirigh linn an Comortas Náisiúnta sinsir a thabhairt linn riamh faraor. Cumann Naomh Pádraig contested the County Senior Final in 1983 but lost out to Dunmore McHales. During the late 70’s and early 80’s Stephen Joyce and Stephen Kineavey were regulars on the Galway senior team. They both played in the 1983 All-Ireland final which Galway lost to Dublin. Stephen Kineavey won an All-Star that year. John Flynn, Michael Conroy and Frank Walsh were involved in 1980 with the Galway senior team. In 1985 Cumann Naomh Pádraig won the County Senior League and Gerry Kineavey (who later became a well known Inter-County referee) and the late Michael Summervile won All-Ireland Junior medals with Galway. That year also marked the opening of Ardán Uí Chadhain in memory of the late Seamus Kyne. This facility has been further developed since and now has four dressing rooms, a gym, and kitchen under the stand. Great credit has to go to the officers and members of Cumann Naomh Padraig for their foresight at that time and especially to John Joe Halloran who was the driving force behind the development. In 1988 the club was relegated to Intermediate but returned to Senior Football in 1989 by winning both the Championship and League. Also in 1989 Tomas Burke was a member of the Galway U21 Team which lost to Cork in the All-Ireland Final. The Galway team was managed by John Joe Holleran who is the current vice-chairman of the Galway County Board. Gerard Kyne and James Reilly were members of the Galway Minor Team in 1990. The club was relegated again in 1993 and returned to senior football in 1994 by winning both the League and Championship. The club continued playing senior football until 2001 when it was relegated to Intermediate. In 2002 we lost the County Intermediate Championship to Claregalway. In 2003 we lost the County Intermediate Championship final to Cortoon Shamrocks and in 2005 we lost to Caherlistraine both in the County Championship and League finals. However, we did get promoted to senior football by being runners up to Caherlistraine on both occasions. Unfortunately, we were relegated the following year to Intermediate football. Although it was sometimes difficult to field teams at under age due to small numbers of players available to the Club, nevertheless, Cumann Naomh Pádraig has had some success. Under 14 and 16 titles were won in the 90’s and in the last number of years the club has enjoyed great success in both girls and boys competitions which augurs well for the future. Pat Lambe played minor football for Galway in 1993 and 1994 and were beaten in the All_Ireland final by Kerry in 1994. Martin Joe Kelly was also a member of the Galway minor team in 1994. Pat also went on to play U21 football for Galway 1996 and 1997. Eamonn Ó Cuív played minor football with Galway in 2001. Galway footballers won the All Ireland Senior Title in 1998 and again in 2001. While Cumann Naomh Padraig had no players involved on the team, Stephen Joyce was a selector and John Joe Holleran was vice chairman of the football board. Steven was also a selector with the Galway U21’s when Eamon Ó Cuív won an All-Ireland medal in 2002 and Eoin Joyce won an All – Ireland medal in 2005. Steven managed the Galway U21 Teams in 2007 and 2008. Trevor Lydon won an All-Ireland U21 medal with Mayo in 2006. A number of our players have also played and won All-Ireland medals with the Galway Masters, these include Tom Feerick, Martin Joyce, Steven Joyce, Tom Reilly and most recently James Reilly. In 2007 we named our pitch Páirc Sheoighe in memory of two fine young footballers who died at a very young age. Michael Joyce from Cloughbrack (1983–2003) and Kevin Joyce from Munterowen (1981-2006). In 2009 Cumann Naomh Pádraig was relegated to Junior football. Steven Joyce was appointed manager in 2010 and the club reached the West Board Junior Final only to lose to Salthill. 2011 / 2012 will never be forgotten in the history of Cumann Naomh Pádraig The year began by the club winning the Galway Junior Comortas Peile na Gaeltachta. This led to the National Comortas Finals in Donegal where we lost in extra time to the eventual winners Naomh Mhuire. This was the only game we lost in 2011. We defeated Oileáin Árainn after a replay in the West Board final and went on to defeat Headford in the County Junior final. After that we went on to defeat the Roscommon representatives Creggs in the Connacht Semi-Final. On November the 6th 2011 in McHale Park, Castlebar we were playing the Mayo champions Islandeady in the Connacht Final and after a great battle Cumann Naomh Padraig won its first ever Connacht title by two points. We were now destined to meet the Leinster champions Baillivor of Meath in the All-Ireland Semi-final on January 21st 2012 in Carrick on Shannon. The effort the team put in over the Christmas was phenomenal. Under the guidance of manager Steven Joyce and his two selectors Michael Philbin and Padraig Ó Cearnaigh no stone was left unturned. There were several training sessions in Ionad Peile na Gaillimhe in Loughgeorge and in the Connacht Council’s marvellous training facility in Ballyhaunis. All the work and effort paid off with an easy victory over Ballivor. Cumann Naomh Padraig were now on there way to play Derrytresk of Tyrone in the All Ireland Junior Final in Croke Park on February 12th 2012. The three weeks leading up to the All-Ireland Final was one of the most exciting times in the clubs history and everyone in the parishes of Ross and Kilbride and neighbouring parishes rowed in and supported the club in every way possible. The All-Ireland Final itself and the aftermath would certainly provide material for a book but suffice to say here that Cumann Naomh Pádraig won its first All-Ireland in Croke Park by one point. Naomh Pádraig 1-8. Derrytresk 1- 7. The game itself, the reception afterwards in the Regency Hotel and the homecoming the next day will live in our memory for ever. Cumann Naomh Pádraig went on to contest the County Intermediate Semi-Final in 2012 but lost after a replay and extra time to Carna-Caiseal who won the County Final and were promoted to Senior football. We finished the year by defeating Clifden in the League Division 2B Final. Cumann Naomh Padraig had 5 players playing in the Inter County Junior Championship in 2012, Eamonn Ó Cuív, Liam Kearney, Declan Kyne and Eoin Joyce who captained of the Galway team. Trevor Lydon was on the Mayo Team which defeated Galway in the Connacht Final. In 2013 Cumann Naomh Pádraig again reached the Intermediate semi-Final losing to Menlough the eventual winners. In the Division 2A league we won 4 games drawn one and lost two with 2 games yet to play. Mar atá ráite cheana níl a fhios againn cén fís a bhí ag na fír a bhunaigh Cumann Naomh Pádraig i 1938 ach is cinnte nach bhféadfadh siad a shamhlú an méid a thit amach i bPáirc an Chrocaigh ar an 12 Feabhra 2012. Cumann beag as Dúiche Seoigheach ag buachaint Craobh na hÉireann agus an pobal ar fad beagnach ansin ag tabhairt tacaíocht dóibh. Daoine tagtha as Meircea, Sasana agus chuile áit in Éirinn le bheith i láthair don ócáid. Ós cionn 400 ag an gceiliúradh sa Regency. Oiche go maidin. Agus an turas abhaile lá arna mhárach: Tinte cnámh ag chuile chrosbhóthar ó Bhaile an Chlair go dtí An Fháirche. Na céadta bailithe le failte a chur roimh na bhfoireann (Seampainí na hÉireann) An turas timpeall an cheantair an oiche dar gcionn. Na sluaite ar an gCloch Bhreac, i gCorr na Móna, ar an Mám agus ag na Larches. Oiche eile go maidin. Níl aon dabht ná go bhfuil an síol beag a cuireadh I 1938 tagtha faoi bhláth go maith faoin am seo. Neart in Aontas. Tá peil á imirt le fada an lá ar an bhFairche, Corr na Móna, An Chloch Bhreac, An Mám, Fionnaithe agus Cill Bhríde. Cé nach raibh aon chumann sa cheantar go dtí 1938, b’as Corr na Móna duine de bhuaiteoirí Craobh Na h-Eireannna i gcluiche ceannais na hÉireann sa bhliain 1934. B’é sin Prionsias de Burca, a bhí ina uachtarán ar an gcumann ar feadh na mblianta ina dhiaidh sin. I 1938 ghlac an Roinn Taillte Eastát Guinness ar lámh. Thug toscaireacht ón gceantar, fir áitiúil John J. Burke, Tommie J. Kyne agus Edward Lynch aghaidh ar Bhaile Átha Cliath le bualadh leis an Aire Taillte, Gerard Boland. D’éirigh leis an toscaireacht úsáid na talúna ar a dtugtar Páirc Seoighe anois a fháil. Gearradh £5:00 sa bhliain cíos ar an bpáirc, airgead an-mhór ag an am. Osclaíodh an pháirc ar Lá le Pádraig 1940 agus bhí an cumann gníomhach ar feadh roinnt blianta. Tar éis tamaill theip ar an gcumann ach, a bhuíochas do Jackie Burke, a bhí ag feidhmiú mar rúnaí ag an am, a lean air ag íoc an chíosa, d’éirigh leis úsáid na páirce a choinneáil don chumann. Rinneadh athbhunú ar an gcumann in mí Eanáir na bliana 1954. I 1952 bhuaigh Seamus Kyne (nach maireann) bonn uile Éireann le foireann mionúir na Gaillimhe. Sa bhliain 1953 shroich cumann Uachtar Ard Cluiche Ceannais an chontae agus bhí roinnt mhaith imreoirí as Cumann Naomh Pádraig ar an bhfoireann buacach sin. Sna caogaidí d’fhulaing an ceantar seo, cosúil le cuid mhaith ceantair eile ón imirce agus b’éigin glacadh le imreoirí ó cheantar an Chlocháin agus Rinn Mhaoile. B’é an bua a fuaireamar ar Réalta Thuama i 1956 i sraith Sinsir an Chontae buaic phointe na mblianta sin. Bhuaigh Réalta Thuama seacht gCraobh an Chontae as a chéile sna blianta sin. Cuireadh deireadh lena ré órga i mBaile Átha an Rí nuair a bhuaigh Cumann Naomh Pádraig ar Réalta Thuama leis an scór 3 : 05 in aghaidh 2 : 07. I 1959 bhuaigh Cora Fine ar Naomh Pádraig i gcluiche ceannais Sóisir an chontae agus bhuaigh Baile an Mhuilinn orthu i gcluiche Ceannais Sóisir i 1961, cluiche a imríodh ar lá chinn bhliana 1962. Bé seo an chéad toradh riamh a craoladh ar Radio Éireann. Ba mhór an tura gur mar seo a bhí an toradh – Baile an Mhuilinn 0-10 Naomh Pádraig 0-2. I 1962 bhí dhá bhua mhór againn. Bhuamar ar Chathair Liostráin i gcraobh soisir na Gaillimhe leis an scor 1:02 v0:02 rud a thug deis dúinn imirt sna sinsir. Ar an lá céanna bhuaigh foireann ar a raibh imreoirí ó Chumann Naomh Pádraig agus Uachtar Árd cluiche ceannais Ghaillimh Thiar i bpeil shinsir. Ghlac Seamus Kyne dhá chorn an lá sin. D’imríomar i ngrád na sóisir arís le linn na seascaidí. Bhí an scéal mar a chéile sna seachtóidí. Buaileadh muid i dhá chluiche Ceannais Contae – 1975 i gcoinne Muine Mheá agus 1976 i gcoinne Cathair Liostrain. Bhí an bua againn ar Naomh Breandáin i 1977. Ba bliain cháiliúil í 1983 i stair Chumann Naomh Pádraig. D’imir Stiofán Seoighe agus Stiofán Ó Conámha do Ghaillimh in aghaidh Bhaile Átha Cliath i gCluiche Ceannais na h-Éireann. Chomh maith leis sin shroich an cumann cluiche Ceannais Sinsir na Gaillimhe. Ní raibh an bua ag ceachtar foireann áfach. Bhuail Baile Átha Cliath Gaillimh agus bhuaigh an Dún Mór ar fhoireann Naomh Pádraig. Bhain Stiofán Ó Conamha gradam All Star amach an bhliain céanna. I 1985 bhuaigh an cumann shraith sinsir an chontae. Osclaíodh Ardán Uí Chadhain in ómós Seamus Kyne. Tá forbairt mhór déanta ar an áit seo ó shin. Tá cheithre sheomra feistis, seastán agus páirc traenála ann anois. D’imir an cumann sa ngrád idirmheánach i 1989 agus d’eirigh linn craobh an chontae a bhaint amach. Bhuamar craobh an chontae arís i 1994 nuair bhí an bua againn ar Naomh Breandáin i gcluiche ceannais an chontae. D’imir an cumann sa ngrád idirmheánach arís i 2001. Chaill muid i dtrí chluiche ceannais contae sa ngrád idirmheanach --i 2002 in aghaidh Baile Chláir, i 2003 in aghaidh Cortún agus i 2005 in aghaidh Cathair Liostrain. Sa bhliain 2009 chuamar síos go grad na Sóisir. Bhíomar ar ár mbealach go Páirc an Chrocaigh. Is cinnte go bhfuil ábhar leabhar sa méid a tharla roimh Cluiche Ceannais na hÉireann, i rith an chluiche agus taréis an chluiche ach is leor a rá anseo gur bhuaigh Cumann Naomh Padraig craobh na hÉireann leis an scór Naomh Pádraig 1 : 08, Doire Treisc 1 : 07.